Halloween has always been my favorite holiday....but not even I can appreciate the trick the Rangers played last night on their fans showing up for a the first win in a renovated MSG. Yes last night was frightening to say the least. There was a time when this would be no surprise as the Sens seemed to have our number. Well at least the number of the old Rangers. But now we're a new team...a young team, with a young captain. a star center, and super skilled winger, an all star goalie and chock full of homegrown young players coming up in the system. Treat or Trick? 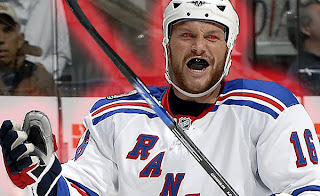 I'll let you judge for yourself...I know what I saw on the ice last night. Read the official Replay here. Lonely at the Top: We got this, relax people! On with this early Halloween edition. Hmm.... It started a night like any other. Looking for a win at home, our club came out motivated and looked for their first win at home. oh.. if it was only that easy. Finding themselves outplayed they got behind. So they coasted with a "don't panic" mentality and patiently waited for a break; passing the time, shuffling pucks around the endboards... chipping them up the sideboards, turning them over at the blue line and getting pinned in there own zone for minutes at a time like a bunch of trick or treaters that were instructed not to leave their block in search of a sugar jackpot. That appears to be the status quo as far as offense goes now with this coaching staff. 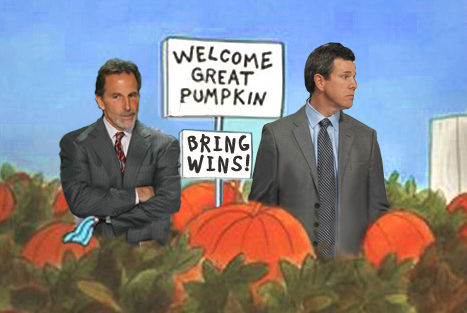 The belief that things will suddenly click and result in an explosion of goals if the lines are mixed the right way by Torts, the mad scientist is a pipe dream. We did manage to catch a break when Anisimov was caught from the side while turning to circle up the boards again and managed to go into the boards head first, resulting in Ottawa getting hosed on a 5 minute boarding call (I'm a Ranger fan but that hit was legal). I was glad that we managed to take advantage of our unexpected windfall with 2 power play goals (including Richard's first in the Garden as a Blueshirt) and went were up by 1, but I still wondered if we could managed to eek by without that lucky call. My questions seemed to be answered when we managed to keep the flow going, capitalize on some mistakes made by Ottawa and found ourselves with a commanding 4-1 lead. Then, as quickly as it came, it left... 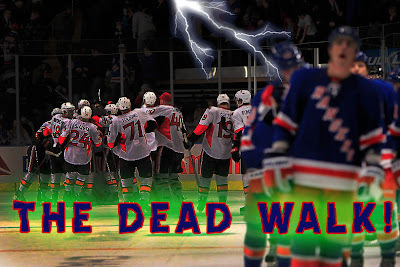 The Sens turned up the pace just as we clicked the autopilot button and clawed their way back from the brink. Surely the Ranger fans in attendance thought, this can't happen. Perhaps many were reluctant to panic because we still had a lead, whether it was a 3 goal lead, then a 2 goal lead...then a 1 goal lead.... Ok, so they tied it up...but we have one of the best goalies in shootouts in our net. Why worry, right? ummm.. lets see.. O for 3 in the shootout. It's like going to biggest house on the block with the best costume and goodie bag and find their giving out fruit.. Sonova... At the end of the night, what started as a breakout game, became a break even game, and eventually a heartbreaker of a game. How can this continue? Over the last couple of games, I've heard the coach say, No excuses... We can't blame it on travel, on injured players or anything else. Of course, he meant "we" in the "it's you f*ckers that are making me look bad" sense of the word. A game like last night's will tell you alot about the leadership of the team. When the panic starts, is usually the best time for a captain to step up and lead by example. I think Cally does a good job night in and night out leading by example. He went out and righted a wrong by scoring a goal after inadvertently tipping one past Henrik. It's also telling when players make reference to a guy you sent down to the minors, as a difference maker. The fans have been saying it for a while, but to hear it from guys like Henrik and Boyle, it only makes the team concept look more diluted. I'm sure they have been pulled aside for that, but who gives a crap. The team is telling their coach what they need to win. You'd figure the coach of a team that couldn't even coast to a regulation win with a 3 goal lead, would be open to suggestions. The decision to keep Christensen is looking worse with every shootout loss. Defending the decision, by touting Christensen as a more skilled versatile player only makes Tortorella look like more of a putz. Avery can turn the puck over along the boards and take penalties just as good as anyone else on the team. P.S. - Happy Halloween. Remember to make your little Rangers visible when the go trick or treating and to check their candy. The world is not as safe as it once was. The existence of Gary Bettman is proof of that.